Network outages can be deadly, whether your network is a complex carrier network or just a few machines supporting a small enterprise. "JUNOS High Availability" will help you build reliable and resilient networks that include Juniper Networks devices. With this book's valuable advice on software upgrades, scalability, remote network monitoring and management, high-availability protocols such as VRRP, and more, you'll have your network uptime at the five nines, or 99.999 percent of the time. Instead of focusing on 'greenfield' designs, the authors explain how you can intelligently modify multi-vendor networks. By looking at how existing protocols and platforms are currently used, and adapting new devices to them, you can deploy continuous systems even when reporting scheduled downtime. With this book, you will learn how to: upgrade routing engine software painlessly; manage network equipment with Best Common Practices; integrate routers and switches from multiple vendors in a mature network; enhance scalability by adjusting network designs and protocols; combine the IGP and BGP networks of two merging companies; perform network audits; identify JUNOScripting techniques to maintain high availability; secure network equipment against breaches, and contain DoS attacks. Automate network configuration through specific strategies and tools. 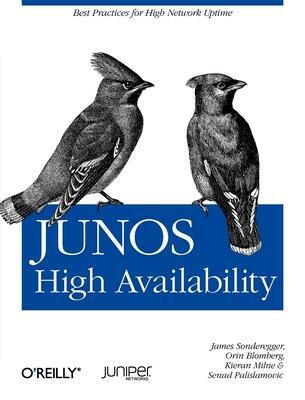 "JUNOS High Availability" will save you time and money no matter what kind of network you have. Written by four system engineers with vast expertise in maintaining continuous systems, this book is a core part of the Juniper Networks Technical Library. James Sonderegger (JNCIE-M #130, JNCIS-FWV, JNCIS-ER, and Juniper Certified Instructor) holds a MS in IT Management and is a Resident Engineer Manager on Juniper Networks' Professional Services Team. James spent five years as an Engineer in Residence for Federal customers and has been in the networks industry for the last twelve years. His former employers include The Analysis Corporation (TAC), Ericsson IP Infrastructure, and Automated Data Processing. James was a co-author on "Juniper Networks Reference Guide. Routing, Configuration, and Architecture", ISBN 0201775921, Addison-Wesley Publishing, 2002. Orin Blomberg (CCNP, CCSP, CCIP, CCVP, CCDP, JNCIS-M, JNCIS-FWV, JNCIS-ER, JNCIA-IDP, JNCI) is the technical lead for SSL VPNs and remote access at the Washington State Department of Information Service. His primary responsibilities include providing remote access and secure connectivity for state agencies, county, city governments, and tribal nation governments, as well as connectivity to federal agencies. His former employers include General Dynamics C4 Systems, Ericsson IP Infrastructure, and the US Army. Kieran Milne (JNCIE-M #380, JNCIS-ER, JNCIA-WX, JNCIA-EX, JNCIA-E, JNCI, CCNA, Nortel NCTS) is a training developer and technical trainer within the Education Services department at Juniper Networks. With over ten years of experience in the networking industry, Kieran has taught all over the world, in both corporate and college settings. Before joining Juniper Networks, Kieran spent time at Nortel Networks and Alcatel. He is the author of the O'Reilly book JUNOS Networking Essentials, and contributes to exam development for the Juniper Networks Technical Certification Program. Kieran lives and works out of Canada. Senad Palislamovic (JNCIE-M #145 and JNCIS-E) is a Professional Services Engineer at Juniper Networks, where he consults, designs, and implements MPLS enabled NGEN services for largest global ASPs and financial networks. He has also worked as a JTAC Engineer troubleshooting major ISPs' networks. Before JTAC, Senad held various network positions at Weber State University where he designed and implemented scalable network solutions. Senad holds B.S Degree in Telecommunications and IS&T from Weber State University and has over 10 years of experience in various enterprise and ISP networking technologies. He lives in New York with his wife Samera.